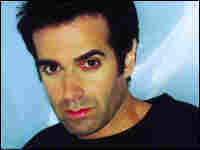 The Gift of Kindness Magician David Copperfield makes mind-boggling illusions like walking through the Great Wall of China seem easy. But he believes simple gestures of kindness are far more valuable than any magic trick. I am writing these words a few weeks after my father's death. He was a fervent Republican. He preached an eye for an eye. He was a hawk. But he practiced kindness to everyone, including people he didn't know and people he knew too well. My father wanted to be an actor. He traded his dream for solid middle-class security, a beautiful wife and a son.